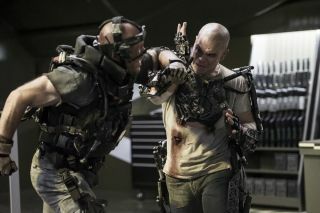 Matt Damon (right) stars in Columbia Pictures' "Elysium," which promises lots of action. Opens August 9, 2013. Matt Damon is off on another sci-fi adventure. Fresh off his star turn in this year's blockbuster "Elysium," the actor will play a small role in the thriller "Interstellar," which is scheduled to come out in November 2014. "Interstellar" follows a band of explorers who travel between the stars by going through a wormhole. The film is directed by Christopher Nolan, who also helmed "Memento" (2002), "Inception" (2010) and the last three Batman titles — "Batman Begins" (2005), "The Dark Knight" (2008) and "The Dark Knight Rises" (2012) — among other films. "Interstellar" has some serious star power. In addition to Damon, it features Matthew McConaughey, Anne Hathaway, Jessica Chastain, Ellen Burstyn, Michael Caine, Topher Grace, Casey Affleck, Jon Lithgow and several other prominent actors. The film is based on a treatment by Caltech theoretical physicist Kip Thorne, who is also serving as an executive producer. So there's a good chance that "Interstellar" will place a priority on getting most of its science right. The news of Damon's involvement was first broken by The Playlist, which reported that the actor will have a small role. He'll be participating in just two weeks of filming, while the entire film will shoot for about four months, according to The Playlist.